'Miss Nellie' ( James Burch, R. 1979). Seedling #38-2. BB, 27" (69 cm). Early to midseason bloom. Standards greyed yellow (RHS 160C) blended with pale violet (84D); falls dark red-violet (71A) edged with light violet (80B); yellow-green (153D) beard. 'Child Star' X 'Mexicali'. Burch 1983. Honorable Mention 1985; Award of Merit 1987; Knowlton Medal 1990. From AIS Bulletin #249 April 1983 Introducing MISS NELLIE-BB (Child Star X Mexicali) The tightly domed standards are yellow (RHS 160C) blended with pale violet; falls are flaring and red-purple (71A) in the center, edged in lighter purple. 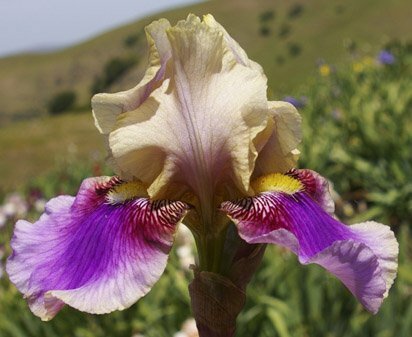 This dainty iris was named for Mrs. Nellie Stewart, a spry, long time AIS member. HC '82, EC '82. $15.00. Burch Iris Garden.